Fluorine is one of the vital organic chemistry elements, which can lead to significant variations in molecules’ chemical and physical properties. Thus, organofluorine compounds have been widely used in functional materials, medicinal science, life science, and many other fields [1, 2, 3, 4]. In contrast to the abundance of inorganic fluorine-containing compounds, naturally occurring organofluorine compounds are scarce. Therefore, many efforts have been taken to develop fluorine-incorporation methods into organic molecules . Among them, deoxofluorination of alcohols via nucleophilic fluorination is one of the major methods to acquire alkyl fluorides (Fig. 1). After SF4 was successfully applied in deoxofluorination in 1958 , many deoxofluorination reagents have been invented [5, 6, 7, 8, 9, 10, 11, 12, 13, 14, 15, 16, 17]. At present, the widely used reagents can be divided into three categories: 1) sulfur fluorides and their derivatives (SF reagents, Fig. 1a) [7, 8, 9, 10, 11]; 2) α-fluorinated amines (NCF reagents, Fig. 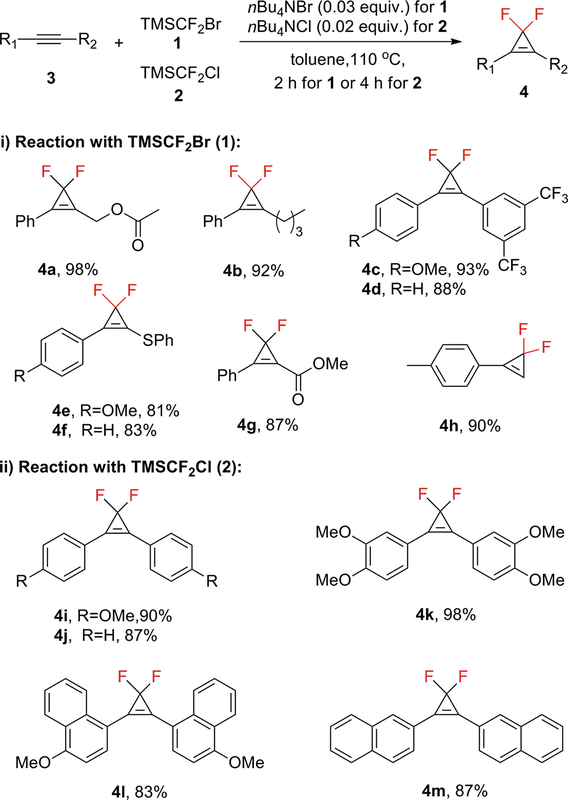 1b) [12, 13, 14, 15, 16]; and 3) fluorination reagents with an all-carbon scaffold (CCF reagents, Fig. 1c) . Deoxofluorination of alcohols, aldehydes, ketones, and carboxylic acids with SF reagents or NCF reagents can be achieved, but suffers from some disadvantages such as low thermal stability, sensitive to moisture, harsh reaction conditions, requirement of external fluorides sources, and/or lack of selectivity in many cases. However, CpFluors are easy to make and not sensitive to moisture. The reaction condition is mild, and better selectivity is found in deoxofluorination of alcohols with CpFluors than in that with other reagents on various occasions . The 3,3-difluoro-cyclopropenes can be synthesized through difluoromethylenation of the corresponding alkynes with many difluorocarbene sources [18, 19, 20, 21, 22, 23, 24, 25]. Efficient preparation of CpFluors can be achieved by the routes reported by Hu group [17, 18, 19]. As shown in Fig. 2, various alkynes can react with TMSCF2Br or TMSCF2Cl, affording corresponding 3,3-difluorocyclopropenes in good yields. Both disubstituted and terminal alkynes could be transformed into difluorocyclopropene products in good yields. Electron-donating groups and electron-withdrawing groups can be tolerated (4a-4d). The alkynes which contain sulfides (4e,4f) and an ester (4 g) are also amenable to the reaction. It is worthy to note that CpFluors are white solid and stable under moisture. Therefore, CpFluors are easy to handle, possessing potential in the application of many nucleophilic-type fluorination processes. 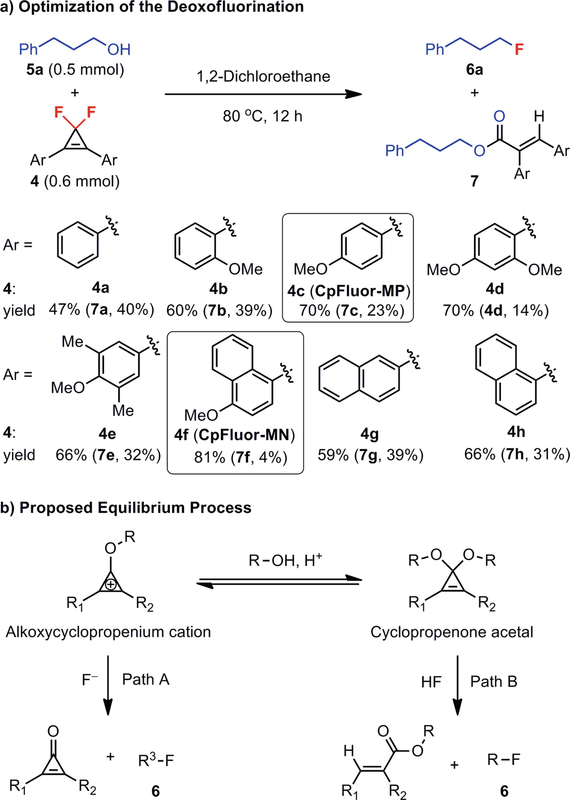 Deoxochlorination of alcohols with 3,3-dichlorocyclopropenes via cyclopropenium cation activation was proved to be an efficient process [26, 27]. However, deoxofluorination with the analogues 3,3-difluorocyclopropenes is more difficult because of the weak nucleophilicity of fluoride ion under similar conditions. The in situ-generated HF can be consumed by the glass (mainly SiO2); therefore, a nonglass vessel should be used for the deoxofluorination of alcohols with CpFluors . Hu and coworkers disclosed that polytetrafluoroethylene (PTFE) container can significantly improve the yields of fluorinated products. 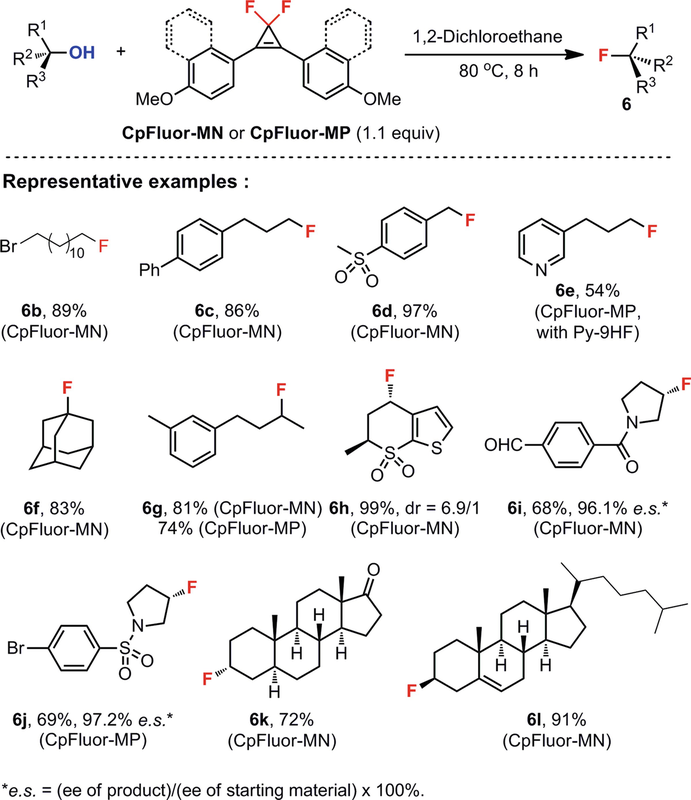 The electronic nature of CpFluor is critical for fluorination of monoalcohols via alkoxycyclopropenium cations, and CpFluors with electron-rich aryl substituents can facilitate the transformation with high efficiency (Fig. 3a, CpFluor-MP, CpFluor-MN). Possible explanation is that the electron-donating group can better stabilize the cyclopropenium cation intermediate, avoiding the formation of cyclopropenone acetal intermediate (Fig. 3b). But in the selective monofluorination of 1, 2- and 1, 3-diols process, which proceeds via cyclopropenone acetals, the effect of electronic nature of CpFluors is not obvious. 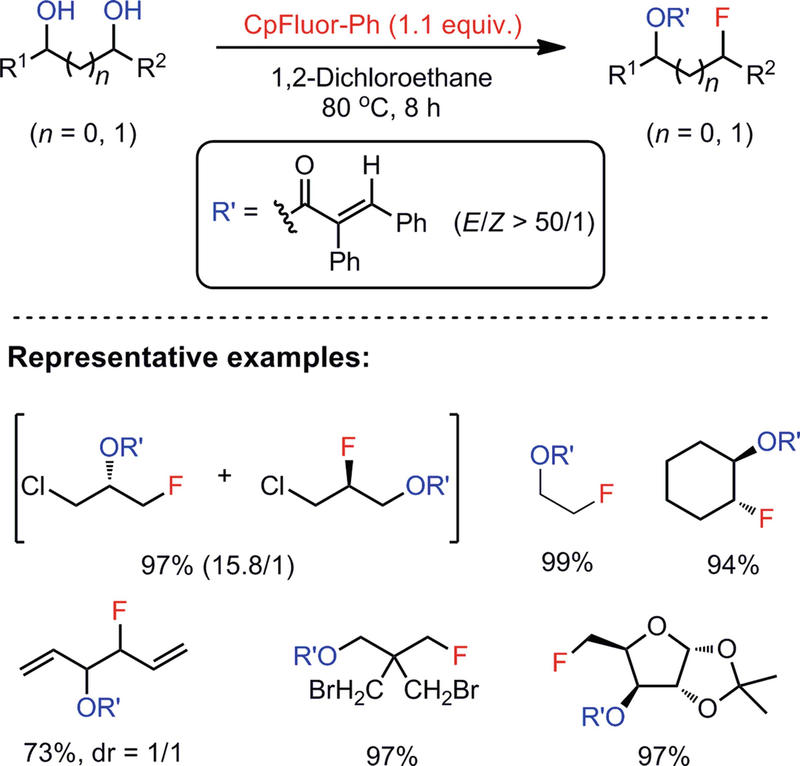 However, CpFluors are sensitive to the electronic nature of alcohols, thus selective fluorination at the relatively electron-rich position of longer diols can be achieved. With CpFluor-MN or CpFluor-MP, a variety of monoalcohols can be transformed to alkyl fluorides in good yields (Fig. 4). Heating the mixture of an alcohol substrate in 1,2-dichloroethane for 8 h, with only 1.1 equivalent of a CpFluor reagent, affords the desired product. Primary alcohols, secondary alcohols, and tertiary alcohols are all amenable to the reaction. Usually, chiral secondary alcohols were converted to fluorinated compounds with inversion of the configuration (Fig. 4, 6h-j). Compound 6 l was obtained with retention of the configuration because of a homoallylic participation during the deoxofluorination process. Tertiary alcohols are challenging substrates for deoxofluorination due to the competing elimination reactions, but 1-adamatanol could be deoxyfluorinated in 83% yield. Aldehydes and ketones can be fluorinated with DAST and its derivatives such as Deoxo-Fluor and Fluolead [7, 8, 9, 10], but the CpFluors deoxofluorination chemistry can tolerate these functional groups. Moreover, amide, carbamate, and sulfonamide are also tolerated. For the pyridine-containing substrate, the addition of an acid activator such as pridine-hydrogen fluoride (Py·9HF) was needed for the successful deoxofluorination reaction with CpFluors (Fig. 4, 6e). It is a challenging task to achieve selective fluorination of multiple alcohols, especially the symmetrical diols with common deoxofluorination reagents such as DAST. Limited methods for selective deoxofluorination of 1,2- and 1,3-diols rely on the use of sterically hindered reagents or reagents that can generate stable hydroxy group-protected intermediate [28, 29]. In deoxofluorination of 1,2- and 1,3-diols with CpFluors, the formation of cyclopropenone acetal intermediates is favored, since it is an intramolecular cyclization reaction. Therefore, selective monofluorination can be achieved. CpFluor-Ph is found to be a more efficient reagent than CpFluor-MP, probably due to the faster generation of cyclic acetal intermediate from CpFluor-Ph. With CpFluor-Ph, a variety of 1,2-diols and 1,3-diols were monofluorinated, affording the corresponding alkyl fluorides in good yields (Fig. 5). Primary alkyl bromide, primary alkyl chloride, and alkene can be tolerated. For the unsymmetrical diols, the less hindered position was fluorinated. Selective monofluorination of longer diols, where the two hydroxy groups are separated by several carbon centers, can also be achieved by CpFluor. It is very interesting that the electronic nature of the alcohol, rather than the steric hindrance, controls the selectivity of the deoxofluorination of primary alcohols (5b and 5c). Although, selective fluorination at the benzylic position in the reaction of compound 5b was found, the selectivity was inversed in the reaction of 5c with CpFluor-MN. Possible explanation is that the electron-rich alcohol can promote the generation and stabilization of the alkoxycyclopropenium cation, thus favoring deoxofluorination. 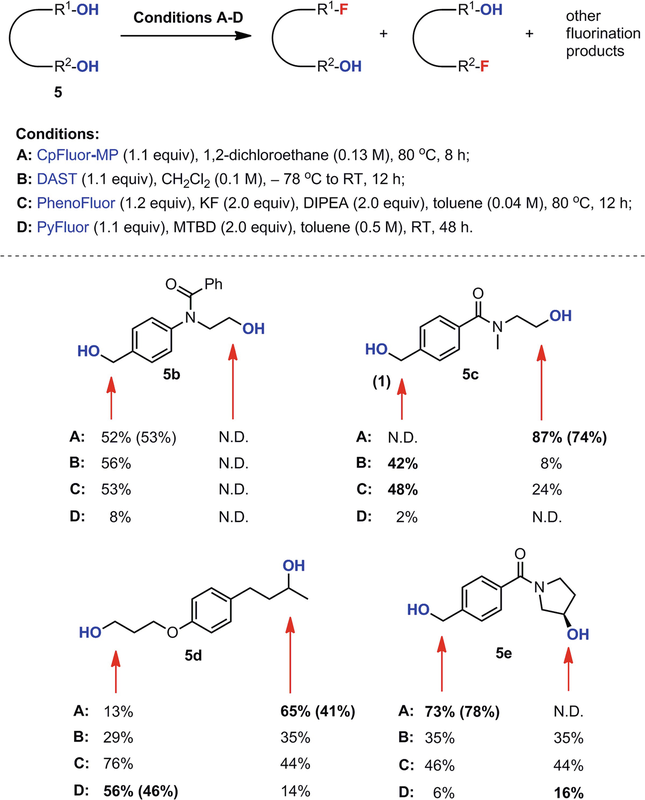 Such high selectivity in the deoxofluorination of compound 5c cannot be achieved with leading deoxofluorination reagents such as DAST, PhenoFluor, and PyFluor. Even secondary alcohol can be favored in the case of compound 5d, since the primary alcohol part is less electron-rich than the secondary alcohol position in this specific case. However, when the primary alcohol is at the benzylic position, the selective monofluorination at that position over the secondary alcohol can be achieved (Fig. 6, 5e). The reaction of alcohols with CpFluors provided high-yielding fluoride products, with unique selectivities, by tuning the electronic properties on the substituents of the reagents. The mechanism is shown in Fig. 7. There is an induction period for the reaction of alcohol and CpFluor, during which HF is formed probably from the hydrolysis of CpFluor by adventitious water. The reaction with CpFluor containing electron-donating group on the aryl substituent shows faster induction. CpFluor undergoes a fast reaction with monoalcohols to afford cyclopropenium salt intermediate A. With electron-donating group such as methoxyl group on the aryl substituent, the intermediate A is stabilized, favoring the deoxofluorination through pathway A. With less electron-rich substituents such as phenyl group, intermediate A is less stabilized, thus will be converted to cyclopropenone acetal B by the second alcohol. In the reaction, intermediate A and B are in equilibrium. However, the thermal-induced ring-opening reaction affords vinylcarbene intermediate C [30, 31, 32]. Protonation of the intermediate C by hydrogen fluoride followed by a fluoride attack gives alkyl fluoride product and acrylate. 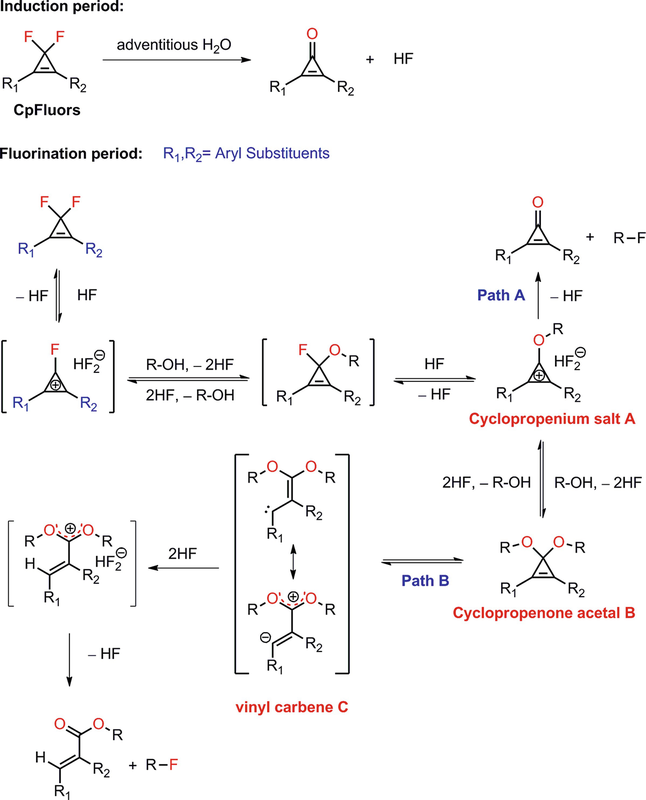 Since the formation of the cyclic acetal of a diol, especially a 1,2-diol and 1,3-diol, is favored regardless of the electronic nature of the CpFluors, the selective monofluorination can be achieved through reaction pathway B. 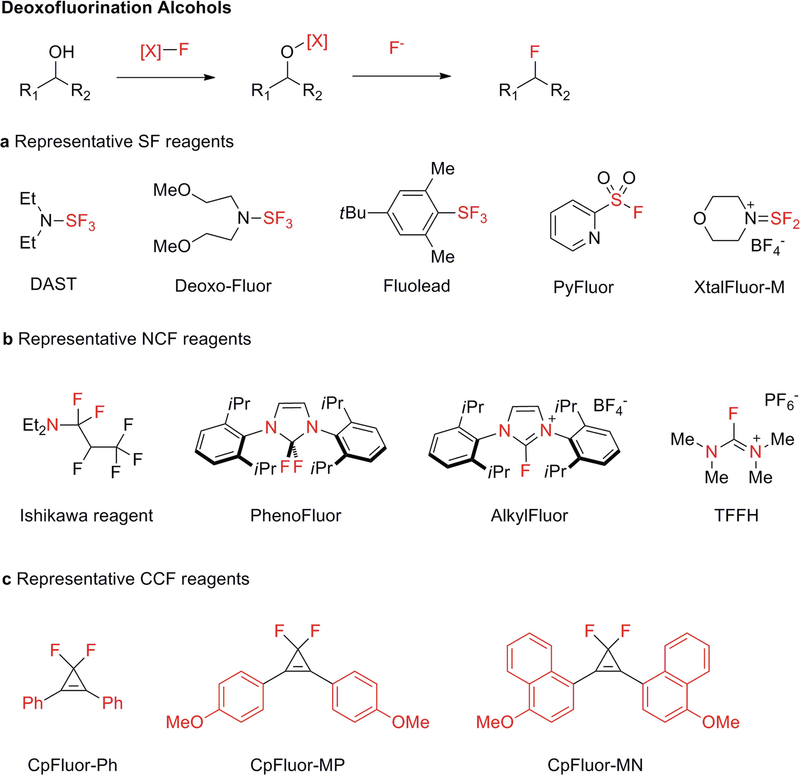 In summary, this chapter discusses the synthesis of CpFluors and their applications for deoxofluorination of alcohols. CpFluors are solid with high stability toward moisture which is an important advantage, compared to the well-explored reagents such as DAST, PhenoFluor, and Fluolead. A wide range of monoalcohols, 1,2- and 1,3 diols, and many other longer diols could be converted to alkyl fluorides in high yields. The unique reactivity and selectivity was tuned by changing the electronic property of the reagents, which provide an interesting way to achieve the C-O bond fluorination. Besides further investigation of the fluorination application of CpFluors, the application of the novel C-O bond activation strategy in other functionalization, such as etherification, thioetherification, amination, and esterification, would also be interesting.